While your baby’s feet may seem sweet, there’s nothing sweet about the smell that may come from them. Foot odor in infants does occur, and it can make your nose beg for mercy. According to Dr. Rosario Labarbera, chief of podiatry at The General Hospital Center at Passaic and at Saint Mary's Hospital in Passaic, New Jersey, children’s feet often sweat even more than an adult's feet. 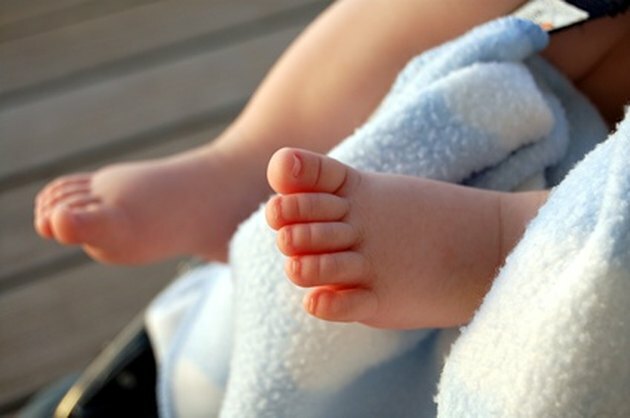 The causes of smelly feet in infants are typically easily treatable with a few preventable measures. Bacteria on your baby’s feet cause bromhidrosis, a condition in which feet are extremely smelly. These bacteria thrive on sweaty feet and feed on your baby’s dead skin cells and skin oils. As these bacteria process their food, they produce sulfur compounds that are similar to those in rotten eggs, hence the smell coming from your baby’s feet. As your baby’s feet sweat, they create a perfect environment for these bacteria to flourish. If you don’t properly clean your baby’s feet daily, the smell will continue. While bathing an infant from head to toe every day isn’t typically recommended, you should wipe your baby’s feet with a warm, wet washcloth daily. MayoClinic.com recommends that you ensure your baby’s feet are completely dry after a bath, even if this requires a bit of powder. You should also avoid putting lotion on your baby’s feet if she’s having a problem with smelly feet, as this will trap moisture against her toes and give the bacteria the food it needs. While those itty-bitty socks may be adorable, they’re likely contributing your baby’s smelly feet. The majority of baby socks on the market are at least partially made from man-made materials; these fibers allow the manufacturer to make soft, stretchy socks at a low price. MayoClinc.com suggests you purchase socks made from 100 percent natural fibers such as cotton or wool. These socks can still be soft enough for your baby’s feet without keeping her sweat against her soles. Even better, Dr. David Gellar, a pediatrician at Massachusetts General Hospital, recommends you take off your baby’s shoes and socks off whenever possible. Little shoes are adorable and they can often complete your baby’s outfit. However, be careful to check the fabric from which the shoes are made if your baby is having problems with stinky feet. Dr. Labarbera advises that you find shoes made of natural materials such as canvas and leather. These will allow any sweat on your baby’s feet to evaporate before the bacteria have a chance to get a foothold. BabyCenter: What Can I Do About My Child’s Stinky Feet?